Liquids. 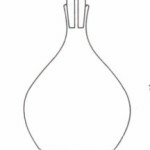 A convenient volume of the liquid is run off into a clean, dry, previously weighed beaker, using either a pipette or burette. The beaker and liquid are then weighed and the mass of the liquid found by subtraction. Solids. 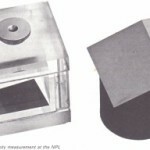 The volume of a substance of regular shape, e.g., a rectangular bar, cylinder, or sphere may be calculated from measurements made by vernier callipers or a micrometer screw gauge. 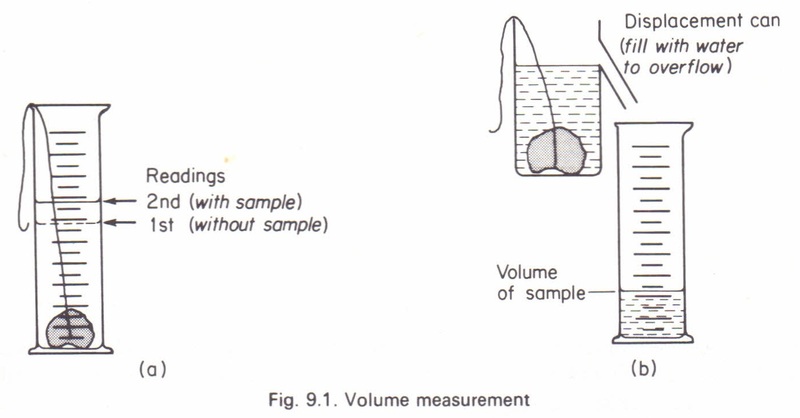 The volume of an irregular solid, e.g., a piece of coal may be found by either of the methods shown in Fig. 9.1, which is self-explanatory. For solids soluble in water, e.g., certain crystals, some liquid such as white spirit would be used in the measuring cylinder. 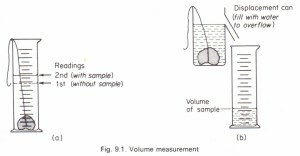 The mass of the solid is found by weighing. In each case the density is calculated from :The above descriptions have purposely been kept short as we shall be describing better methods later on.